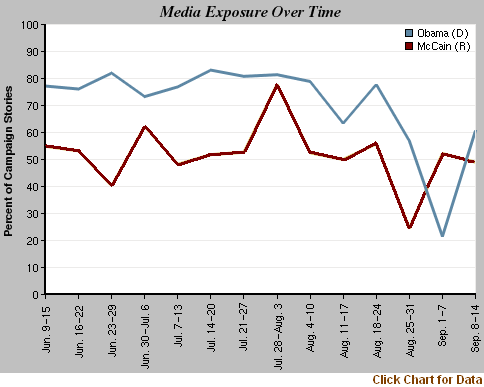 Barack Obama may have generated more coverage, but as has been the case ever since her selection on Aug. 29, Sarah Palin still drove the media narrative last week. Obama, the Democratic nominee for President, was a significant or dominant factor in 61% of the campaign stories from Sept. 8-14, according to the Campaign Coverage Index from the Pew Research Center’s Project for Excellence in Journalism. But for the second week in a row, the GOP vice presidential hopeful got more coverage (53%) than the man atop the ticket, John McCain (50%). Palin’s Democratic counterpart, Joe Biden, has become the virtually forgotten candidate, registering at only 5% last week. Yet even these measures do not fully convey the Palin-centric nature of the news coverage. For all the phrases delivered on the stump, it was “lipstick on a pig,”—which some claimed was a smear against Palin—that fueled the biggest controversy of the week in the media. The buzz continued with her interview encounter with ABC anchor Charlie Gibson and culminated with a widely viewed Saturday Night Live skit featuring Tina Fey eerily resembling Palin. 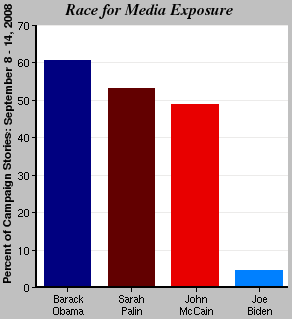 Indeed, campaign storylines revolving around Palin accounted for 50% of the campaign newshole last week. She was the focal point of the four biggest media narratives—scrutiny of her public record (14% of the newshole), the ABC interview (10%), the “lipstick on a pig” flap (10%) and general reaction to her nomination (9%). In addition, the week’s No. 8 storyline was her impact on women voters, at 3% of the newshole. The total for the combined Palin storylines was similar to the previous week, when she accounted for 45% of the narrative. But there was a change in the kind of media scrutiny she faced last week. The week before, coverage of Palin’s personal and family life outstripped the vetting of her record in public office (10% to 6%). Last week, her record—from her stance on the “Bridge to Nowhere” to her acceptance of traveling expenses—accounted for 14% of the campaign newshole. Coverage of her personal life accounted for 2%. Meanwhile, discussion of issues took a back seat in the media narrative. Policy differences between the candidates accounted for only 10% of the campaign newshole. Although issues got more media attention earlier this summer, coverage has receded recently as the politics has heated up. The top subjects last week were the economy at 4% and the Iraq war and terrorism, both at 2%. The strategic elements of the campaign accounted for almost twice as much coverage, (19%). The top storyline, at 9%, was the proliferation of polls showing a tight race with a McCain bounce based, in good part, on Palin. The No. 2 strategic storyline, one that developed late in the week, was the theme of Obama intensifying his attacks on his rival. It accounted for 4% of the week’s campaign coverage. Overall, coverage of the campaign accounted for 39% of the newshole from Sept. 8-14, as measured by PEJ’s News Coverage Index. That represents a significant drop from the two previous weeks when the Democratic and Republican conventions helped the election fill 69% and 58% of the newshole, respectively. But it’s still a relatively high number, one that closely corresponds to the campaign coverage generated during the primary season and an increase in attention from the summer doldrums that were interrupted by the conventions. The campaign was the No. 1 story in all five media sectors, but it generated the most attention in radio (53%) and cable news (63%). “The truth is the governor never rebuffed Congress,” said correspondent Wyatt Andrews. “After a year of supporting the proposed bridge…Palin pulled state funds for the project…But she never said ‘no thanks’ to the federal funds” which totaled $233 million. On Thursday, Palin’s ABC interview, her first sit-down with the media since joining the GOP ticket, commanded the media’s attention. How did the press play the encounter between the governor and ABC’s Gibson? Several headlines emerged, largely on the foreign policy front. The lead paragraph in the Sept. 12 Arkansas Democrat-Gazette noted that she “took a hard line…against Russia,” warning that nation “could eventually face military action from the United States” if it invaded a NATO ally. A more polarizing controversy erupted when, in response to Gibson question, Palin seemed unsure of the meaning of the “Bush doctrine.” Obama supporters seized on that as evidence of her unpreparedness for office. (“She’s Not Ready” was the theme of Bob Herbert’s column.) Palin backers defended her, claiming, as columnist Charles Krauthammer did, that “Gibson got it wrong” since “there is no single meaning of the Bush doctrine.” It may well be that the big Palin debut interview was reviewed largely through the prism of voter preferences and biases. And that led to a front page article in the Washington Post on Sept. 13 that to some extent tried to cut it both ways. The piece indicated that Palin appeared not to know what the doctrine was, but then allowed that the Bush Administration had rearticulated the doctrine so many times it had multiple meanings. By the end of the week, the outlines of a new campaign narrative were taking shape. With Democrats worrying about losing the message battle to the Republicans and the McCain campaign engendering increasing criticism of its tactics, Obama’s decision to get tougher emerged as a storyline. “Obama Raises Level of Attack as Party Frets,” declared the front-page New York Times headline on Sept. 12. For the second week in a row, a dangerous storm was the No. 1 non-campaign story, as measured by PEJ’s News Coverage Index for Sept. 8-14—though it still trailed far behind politics. Hurricane Ike filled 14% of the overall newshole last week, accounting for 17% of the coverage in the online and cable sectors. The No. 3 story overall, at 6%, was another ominous milestone for the troubled U.S. economy, the federal takeover of the two big mortgage companies, Freddie Mac and Fannie Mae. That event was the second-biggest newspaper story of the week at 13%. Next at 6%, were the commemorations of the seventh anniversary of the Sept. 11 attacks, a day in which the two presidential candidates called a truce from campaign skirmishing. And rounding out the top five stories, at 2% of the newshole, was the “Big Bang Machine” particle accelerator experiment. Many of the accounts dutifully noted that it had not destroyed the universe. Note: The second hour of Morning Edition was replaced with the first hour of Morning Edition on September 11.